Perfect weather today for a Patio Awning.... make the most of our sunny days! Read more about Perfect weather today for a Patio Awning.... make the most of our sunny days! With the several late phases of wintry weather having died down and spring having truly come into bloom in recent weeks, you might be seeing the kind of conditions at your Kent home that would lead you to consider investing in some shutters or blinds. 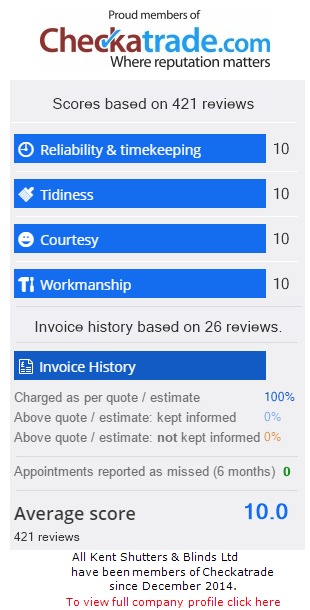 The great news is that whether you’re based in Maidstone, Bexley, Bexleyheath, Sidcup or any other part of Kent, here at All Kent Shutters and Blinds, we can provide the utmost quality shutters and blinds at a price that makes sense for you. the summer fast approaches and you do your spring cleaning, it’s understandable that you may look around your Kent home and consider how it can be given a tasteful revamp this season. May we suggest blinds? After all, they’re a relatively inexpensive home improvement to make, and enable you to quickly and easily control the amount of light and heat flooding into your home. The even better news is that here at All Kent Shutters and Blinds, we can provide the complete range of made-to-measure blinds to suit various areas of your property. Telephones all back up and running - business as usual! Read more about Telephones all back up and running - business as usual! Kent is obviously a lovely part of England in which to live all year round, but it is at this time of year that it most lives up to its billing as ‘The Garden of England’. So many people in such areas as Sidcup, Bexley, Bexleyheath and Maidstone are making the most of the increasingly sunny weather – but could a patio awning from All Kent Shutters and Blinds help you to do that? Shutters fitted recently to a beautiful property in Bexley Park, Bexley, Kent. Before and after pictures - what a difference Shutters make - who agrees!